Hi there! This is post #3 in my Aquarium monitor series. In the previous post I showed how I linked some sensors to my Arduino Nano and coupled that with a Raspberry Pi 2 via I2C. However, I didn’t yet show you how you can now get the data that the Arduino is sending. We’ll get to that in this post, along with details on how to push this data into the cloud, being an Azure IoT event hub. Enjoy! Ok, so I am going to assume that you have done some work on Windows IoT running on a Raspberry Pi 2. If you haven’t, I would suggest following this Getting Started guide from Microsoft. There are some one-time steps to get it all working and after that deploying and debugging from Visual Studio is as easy as pressing F5! So basically this method checks whether it can actually find any devices on the bus. Yes, devices in plural because the protocol supports talking to multiple devices. In this case, there will be only one. State = "No I2C bus found"
As you can see, converting the value from a byte array back to a float is pretty simple. Don’t worry about the device object you see in the above code, you can store the values in any object you want, this is just the one I use (and it will get more clear when I release a full source code sample somewhere in the future). That’s all there is to receiving and unwrapping the message sent from the Arduino. Not that hard either, right? Right! I want to be able to create graphs with the measured values. This, of course, requires storing them somewhere for future use. Whenever certain thresholds are met, I want alarms to trigger. For instance when temperature in my tank is too high or too low, this should trigger an alarm (in the form of a notification on my phone). Last but not least, I want to be able to create a mobile phone app to display the actual values. This requires some kind of endpoint (web service) which the app can query to get these values. To gather messages from these kinds of devices, Microsoft introduced the IoT hub in Azure. This in basis is a service bus (which Azure already had) set-up specifically to communicate with IoT devices and process a lot of data. This is one thing to note; some of the samples out there are built to show the power of the Azure IoT solution, capable of sending tons of messages from tons of different devices. I won’t be doing that, but the basic principles still apply. Luckily most of the parts used are also available in low-cost (and some free) editions so you don’t need limitless credits to get going (I am using my enterprise MSDN subscription which is more then sufficient up to now). Create an IoT hub; this creates the core component, the hub itself. It’s important to keep in mind that this is a service bus without any input or output. So any message your device puts in there, goes nowhere unless you hook up things on the other end. Create a device identity; to connect to the hub, the device is required to have an identity. This is how the device identifies itself with the hub and how the hub knows which device is connecting. As said, an IoT hub have connections to tons of devices at the same time, but we’ll only need one identity for now. Receive device-to-cloud messages; this console app will act as a receiver for messages sent to the hub. It will do not much more than listen for messages and print them to screen, but when it does you’ll know your message successfully made it up there. Having completed the how-to, you should now be able to start sending messages from your Raspberry to Azure. 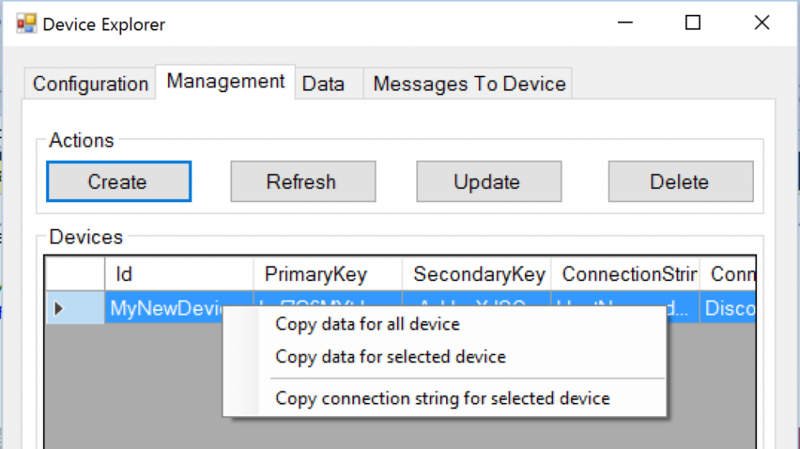 Use the “Copy connection string for selected device” option to copy the connection string you’ll need. As you can see, the code first serializes the object as a json string and then converts that string to a byte array (hey! another byte array!). That byte array is what is sent up to the cloud and processed by the service bus. When you send a message through with the receiving console app attached, it should now show up on your screen! Notice two different kind of messages. The first message is to identify the device with the service. This can help keeping track of when your devices have last booted for instance. The three messages after that contain the actual measurements coming from the sensors. By the way, if you’re interested in a fully working sample; head over to the IoT Remote Monitoring sample on GitHub, which has everything you need (and probably more than you actually need). I’ve used that one as inspiration for the code I’m writing myself (ok you got me, I copy/pasted quite some bits too). So now that we have messages being sent to the IoT hub, the “device” part of the story is pretty much done. And as you’ve seen, it wasn’t that hard; you just need to put all the pieces together in the right way to finish the puzzle. Now that we have data being sent into the cloud, we can start hooking up things to the IoT hub to actually do things with that data. But that my friends, is for the next blog post to detail 😉 Cheers! Heb alles aangesloten en win10 iot geinstalleerd op de Raspberry Pi 3. Ik heb veel ervaring met arduino en dat werkt nu prima temperaturen krijg ik netjes binnen maar de raspberry Pi is voor mij onbekende en leek mij juist een mooi project om hierin bekend te raken maar ik loop hier op vast. Ik weet niet of je me hier een beetje op weg wil helpen zodat ik hiermee verder kan want ik ben erg tevreden met de mogelijkheden met de raspberry. Vindt het een onwijs gaaf project en de opzet voor mij om me te verdiepen in de raspberry Pi.